Cedar shakes, siding, and stone blend with fine exterior detailing for the look of a custom design in this craftsman style house plan. 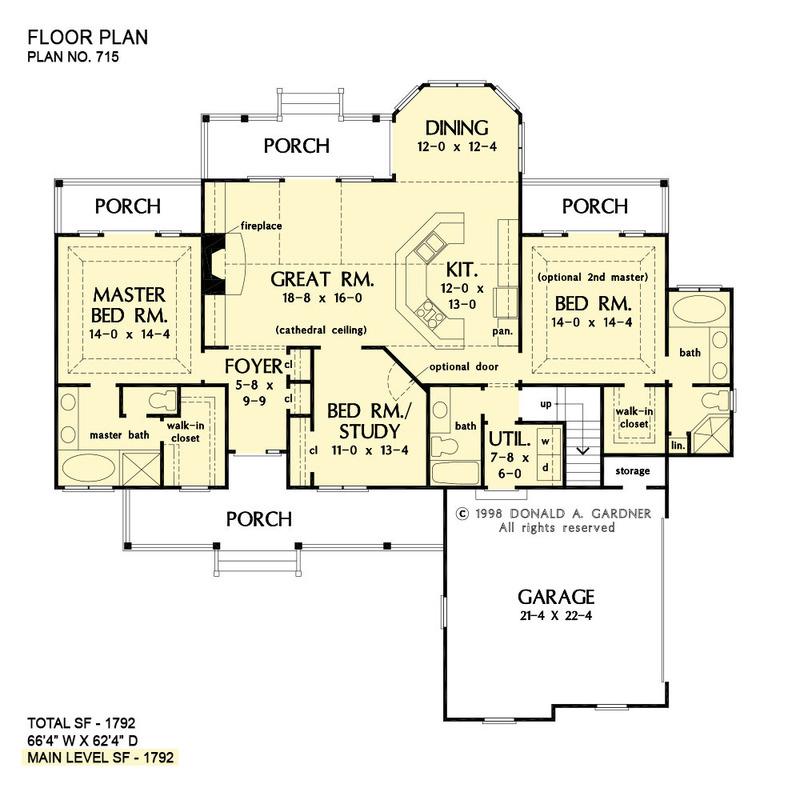 With three porches and a surplus of windows across the back, this house plan was designed to take advantage of exceptional rear views. The great room, kitchen, and dining room are open and combine to create a spacious common area. A cathedral ceiling caps both great room and kitchen for added volume. The master bedroom features an elegant tray ceiling, its own bath with walk-in closet, and private porch. 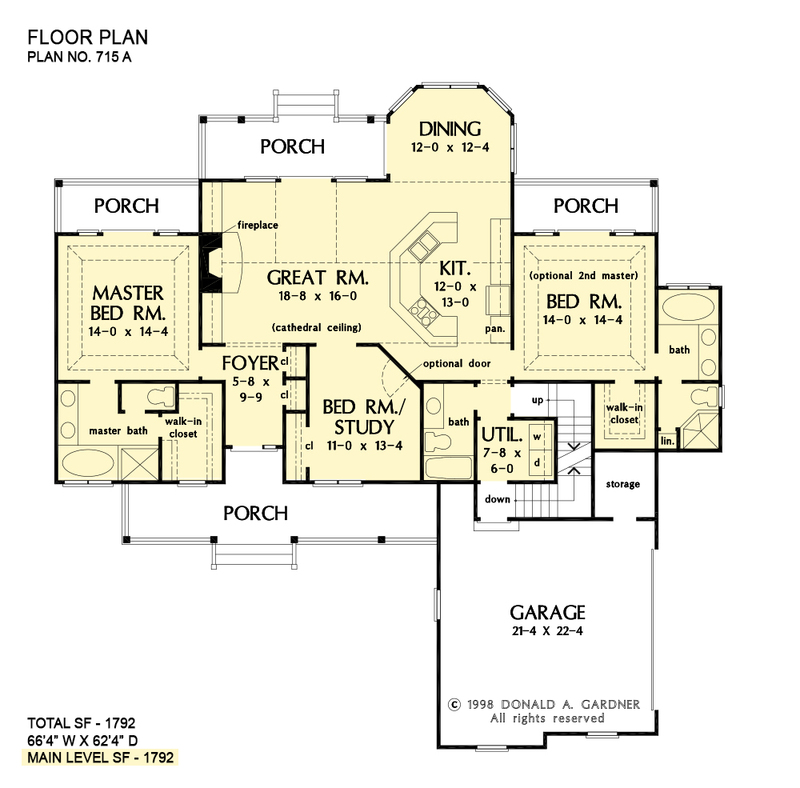 A second master suite is located on the opposite side of the house plan with its own bath, walk-in closet, and porch. 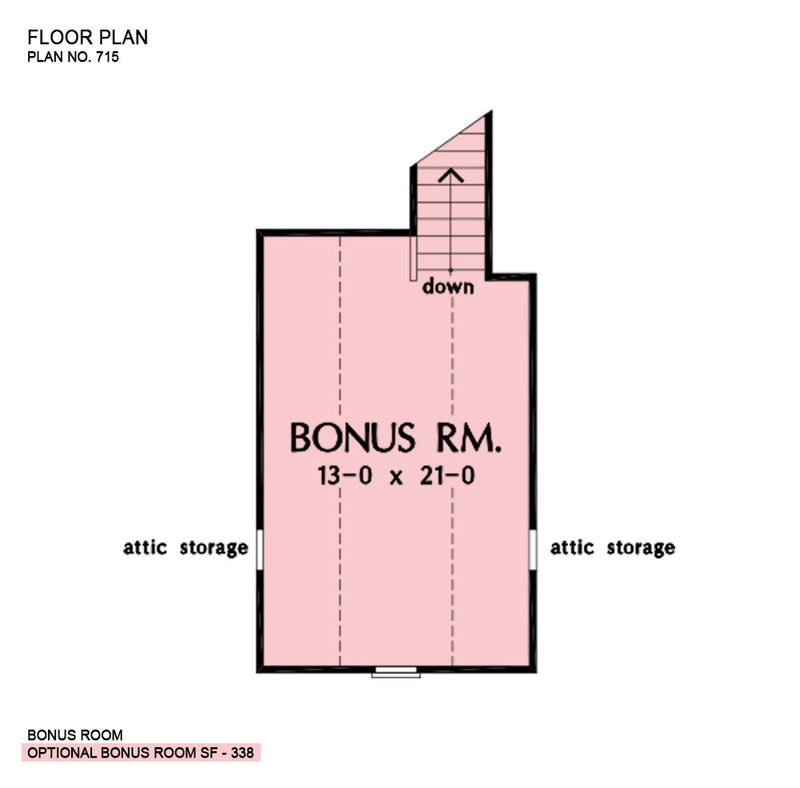 The bedroom/study provides flexibility, and a bonus room offers options for expansion. 1st Floor: 1792 Sq. Ft.
House Dimensions: 66' 4" x 62' 4"
Great Room: 18' 8" x 16' 0"
Master Bedroom: 14' 0" x 14' 4"
Foyer : 5' 8" x 9' 8" x 9' 0"
Dining Room : 12' 0" x 12' 4" x 9' 0"
Great Room (Cathedral): 18' 8" x 16' 0" x 16' 3"
Kitchen (Cathedral): 12' 0" x 13' 0" x 16' 3"
Bonus Room (Vaulted): 13' 0" x 21' 0" x 9' 0"
Garage : 21' 4" x 22' 4" x 0' 0"
Garage Storage : 6' 0" x 2' 10" x 0' 0"
Master Bedroom (Tray): 14' 0" x 14' 4" x 10' 6"
Bedroom / Study : 11' 0" x 13' 4" x 9' 0"
Bedroom #3 (Tray): 14' 0" x 14' 4" x 10' 6"
Porch - Front : 31' 4" x 6' 0" x 0' 0"
Porch - Rear : 18' 8" x 6' 4" x 0' 0"
Porch - Left : 14' 4" x 5' 4" x 0' 0"
Porch - Right : 14' 4" x 5' 4" x 0' 0"